BH2-BHS with 2.5x NFK photoeyepiece; flash; Nikon D90 23.6 mm wide sensor. NB: These fine detail objects that are not absolutely flat need several frames to get everything in focus. However, this causes loss of detail in the subject's surface. The bottom image of just 6 frames shows some surface striations but with the loss of sharpness at the sides. I wonder what happened to the white one? Most of the images so far have been pretty good. I thought it might be useful to illustrate some problems. 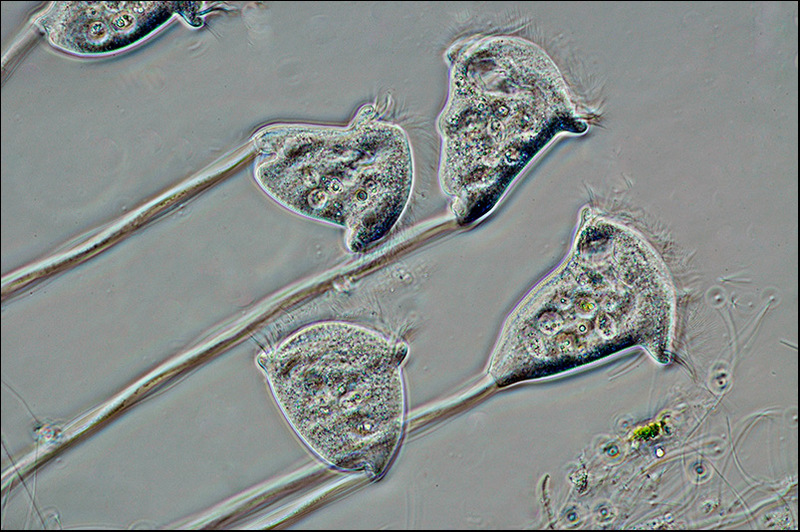 The following pictures were taken using a Canon Powershot G9 mounted on a Zarf Adapter attached to a Zeiss Standard GFL microscope with a Zeiss 1.6/0.03 - 5/0.1 zoom objective. 1. The bright splodges at the top left corner are dust or other rubbish on the camera sensor or in the camera optics. 3. There is colour fringing due to chromatic aberration. 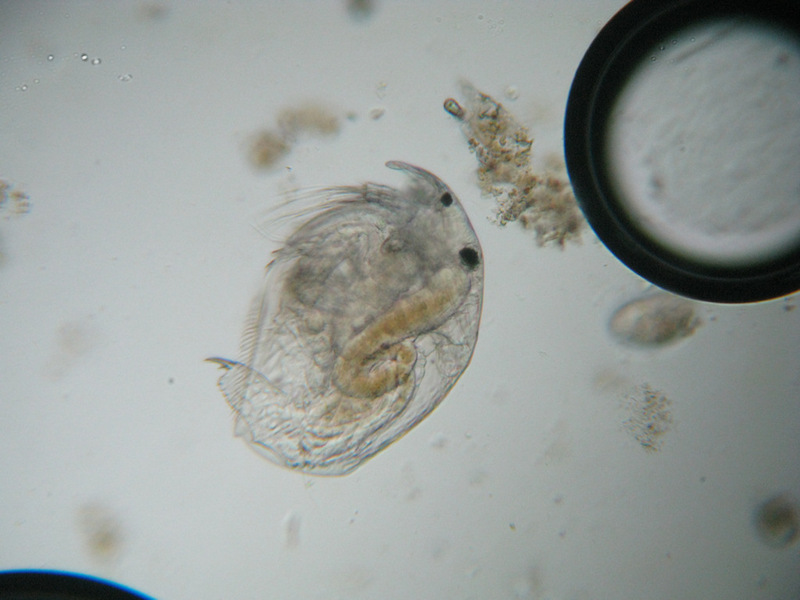 This is particularly noticeable on the detritus above the water flea's head and on the claw of the water flea, as well as around the air bubbles. 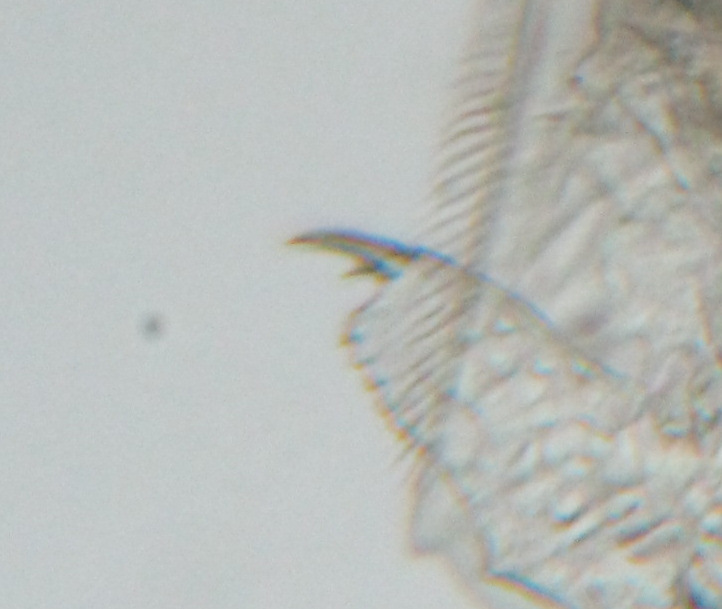 This third image shows extreme chromatic aberration around the margins of the midge larva. It is worse the further from image centre you look. Particularly ghastly in the upper left and lower right corners. You can also see some vertical striations on the left hand side of the image, which is also slightly darker. These result from using a cavity slide with a central concave depression and are "ripples" in the glass. The darker region is due to the lens-like effect of the cavity. Chromatic aberration is one of the problems with the Zarf adapter. It varies with which objective lens is used, but appears particularly awful with this low powered Zeiss lens, which with a Zeiss eyepiece and either a suitable fixed lens camera or a DSLR gives quite acceptable results. It is the camera/adapter that is to blame, not the microscope optics. Within camera dirt is potentially a problem with all types of camera. With a fixed lens camera such as the G9, you can't get inside it to clean. With a DSLR, at least you can clean the sensor cover, but it can be nigh on impossible to remove those very tiny specks that really only show as trails when stacking. Such small dust is too small to dislodge using the built in cleaning systems that attempt to dislodge dust by vibration. 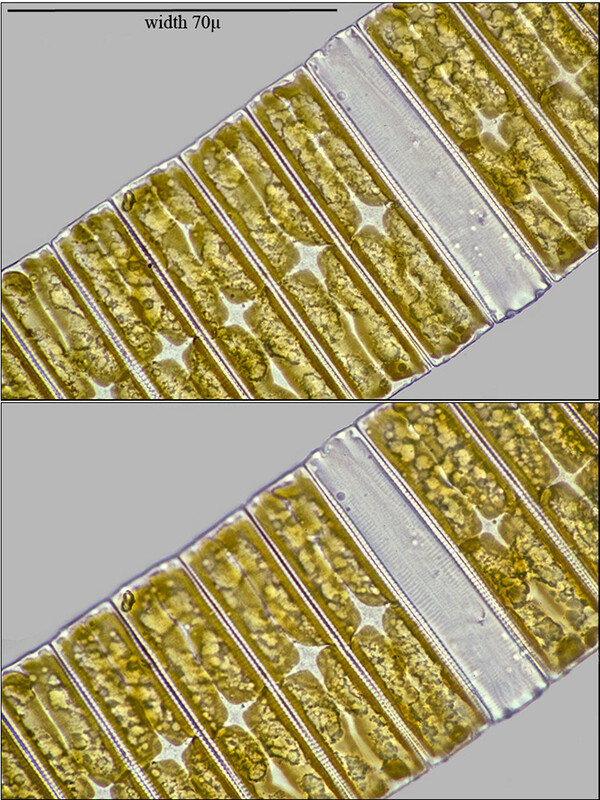 I have removed individual specks in a DSLR by using a degreased size 00 brush (washed in toluene) and a stereo microscope. A tricky procedure. 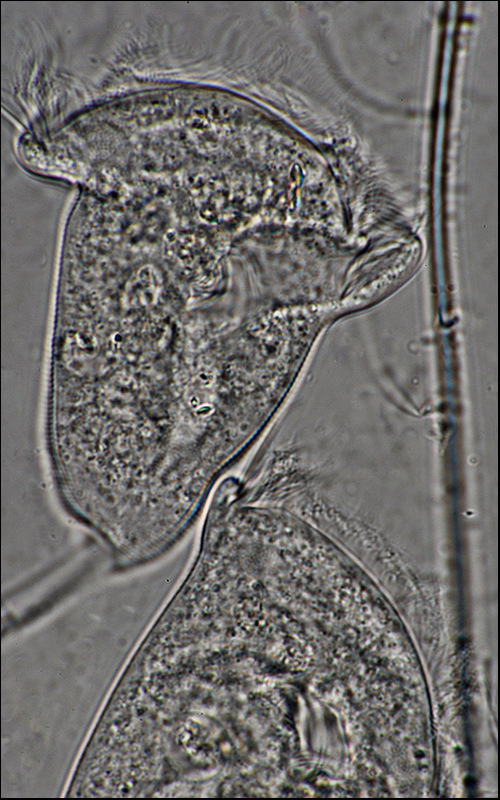 on BH2-BHS with 2.5x NFK photoeyepiece.The wide coverage of the 4x objective makes the use of the 1.25 condenser unusable (gives a bright hot spot in the center). These images with the condenser removed. Green Hydra, contracted and partially extended. When fully extended the specimen was too long to fit in the frame. 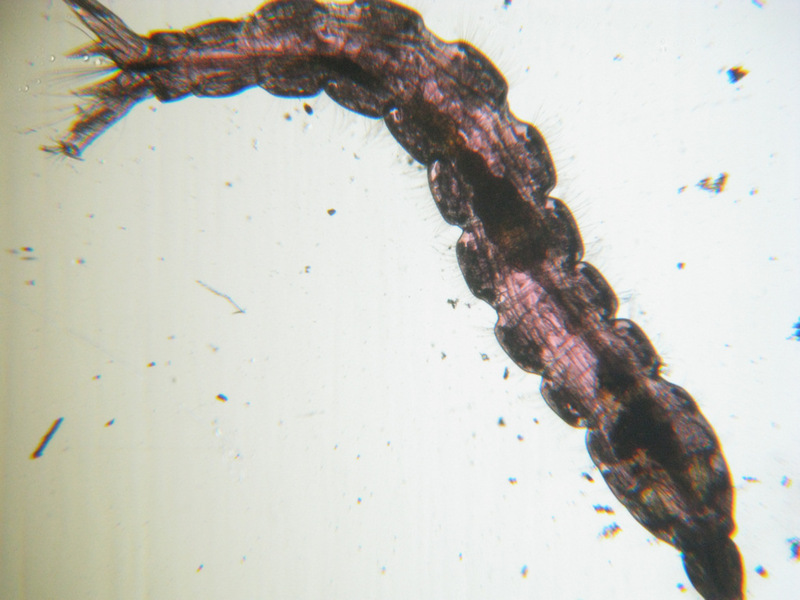 Living, active specimen on cavity slide; single exposures.